The term ‘one stop shop’ is often misused but not when it applies to the EBU’s operational arm, Eurovision Media Services, in relation to the ongoing 2018 European Championships in Berlin and Glasgow. The EBU is the broadcast partner (representing European public service media) to the more than 40 European broadcasters taking coverage from the Championships, across 12 venues in Scotland and the Olympiastadion in Berlin over 11 days of competition. Eurovision Media Services (EMS) and its subsidiary Eurovision Production Coordination (EPC) are serving as both the host broadcaster (overseeing the overall production of the event), and provider of the international distribution of all signals, not to mention other broadcast services. The European Championships is a new multisport event taking place every four years, which aggregates the existing senior continental championships of athletics (European Athletics), aquatics (LEN), cycling (UEC), gymnastics (UEG), rowing (FISA), triathlon (ETU), with a new golf team championships (ET & LET) – all unified under a common brand. Athletics is taking place in Berlin from 7-12 August, while athletes from the other sports are competing around Glasgow 2-12 August. supplying OB services including 11 trucks to the host in Scotland and Videohouse from Belgium with six OB vans in Germany. On top of that, the EBU – through its EBU Technology & Innovation Team – and EMS have been conducting trials in UHD HDR with High Frame Rate and there’s also a European Championship Lounge virtual reality app which is being supplied to rights holders in cooperation with LiveLike. One of the main challenges for EMS, as the host broadcaster, was to ensure consistency across all competitions and negotiate with two local organising committees and seven sporting bodies – plus a plethora of further partners and supporters across the inaugural event. To give you an example: the following is the list of Partners, Supporters, Providers, and Federation Partners to the European Championships in Glasgow alone. Partners: People Make Glasgow, Scottish Government, Strathmore, Spar and Eurovsion. Supporters: Atos, Gleneagles, Harper MacLeod LLP, Avid, NVT Group, aggreko, Glasgow Airport and GL Events: Field & Lawn. Providers: Arco, Adi.TV, Xerox, Csm Live and Airbnb; Federations Partners: European Championships Aquatics (LEN, TYR, microplus, Eurovision, Malmsten, Myrtha Pools, UnipolSai, British Swimming and Scottish Swimming); European Championships Cycling (UEC, ALE, vittoria, Trentino 2020, British Cycling and Scottish Cycling); European Championships Golf (European Tour, Ladies European Tour, Titleist and Saltire); European Championsihps Gymnastics (UEG, Eurovision, Gymnova, Moreau, British Gymnastics, Scottish Gymnastics and UK Sport); European Championships Rowing (European Rowing, World Rowing, WWE, Kafue River & Rowing Centre, British Rowing and Scottish Rowing); European Championships Triathlon (European Triathlon Union, British Triathlon and Triathlon Scotland). At the Broadcast Operations Centre located on the premises of BBC Scotland at Pacific Quay in Glasgow, Eurovision’s Glasgow Events Executive Producer, Marc Stanislas, told SVG Europe, “A number of pre-existing relationships, some of them contractual, provided the production bedrock to ensure editorial standards across what could otherwise have been a quite a disparate group of sports and presentation — streamlining in terms of look-and-feel, graphics, replay, wipes etc. In addition, having two local organising committees was a major challenge for everyone involved in the broadcast. “Since we started we have had some feedback from various rights holders and broadcasters, including the BBC and ZDF, saying they were really happy with the ratings. Of course it’s the first event of its kind and needs to be assessed, but so far people are very happy about the level of coverage. It seems everything has glued together well, from the feedback we have had so far. “This approach helps to bring smaller sports into the limelight, and provides a great platform for them,” said Stanislas. “It helps the smaller federations to be associated with the bigger sports. It’s the first multisport host broadcast production for Eurovision. We have done European and World Championships for specific sports before, but to bring them all together and to produce all of this coverage is a first,” he said. 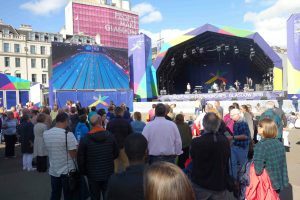 Patrick Johanny, Eurovision’s Glasgow Technical Operations Manager added, “This is an all-in-one package. We may have different names and appellations, but it is all the same team. The fact that EMS manages one of the largest fibre and satellite networks in Europe really helps in terms of building the infrastructure, especially around contribution from our 12 venues and also the complexity of connectivity with Berlin. It’s a very complex network infrastructure: but because we manage that all year long we can handle the full event, end-to-end,” he said. 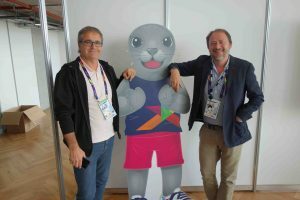 “Given our past experience in many sports and being a part of the European Broadcasting Union,” said Stanislas, “we are able to work with the editorial teams of Members and use their expertise in specific sports. For example, all of the editorial coverage of the aquatics, apart from open water, is being provided by national Spanish television, RTVE. For cycling, we are using the expertise of VRT Belgium, who have a great understanding of this sport. For rowing we have worked with the World Rowing Production team, which does rowing all-year round for FISA. “We know we are very strong editorially,” he said. “We conducted several directors’ workshops in order to align in terms of replay, slow-mos and so on to have consistency across all the disciplines. published by the Glasgow City Council,” said Stanislas. “Not only were they able to provide all the OB vans, with the vast fleet they have, but also coordination required. Their reliability is extremely high. All in all it made sense to go ahead with NEP, and everything is going really well on that level. “For Berlin it was also a bidding process, following the EBU procurement policy,” he said. “There, Videohouse is providing most of the OB vans. Then we have quite a large number of special cameras. We wanted to raise the standard of production, so the standard is between a [typical] European Championships and a World Championships. We have more cameras per sport than we usually provide for a single European Championships – we have brought the standard higher,” he said. 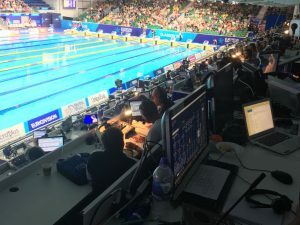 The European Championships put in place two temporary media hubs for media organisations covering the event: the International Broadcast Centre (IBC) in Berlin and the Broadcast Operation Centre (BOC) in Glasgow. “Here in Glasgow we are in a very special position as we have created this Broadcast Operations Centre within the BBC. It’s unique. Usually we are building this from scratch with an organising committee. It was a fantastic opportunity to build the BOC within BBC Scotland. They have offered us very good hospitality and welcomed us. They have been really open to working with us, helping with connectivity and with space. “At the BOC we also have a presence from ARD/ZDF, Swiss TV, RAI from Italy, France Televisions, SVT Sweden and NRK Norway. There are around 30 broadcasters working in Glasgow, not all of them present at BOC,” said Johanny. Reaction to date from broadcasters, federations and the paying public has been very positive so it’s looking like a win-win for everyone. Eurovision gets to showcase its full deck of services to the broadcast community in Europe and individual public service broadcasters – many of whom are losing access to high profile live sports as they struggle to compete in this rarefied world with pay TV operators, emerging deep-pocketed OTT players and dabbling tech giants – are able to show 8-10 hours of beautifully produced live coverage daily across aquatics, athletics, cycling, golf, gymnastics, rowing and triathlon. 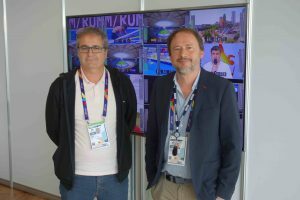 Matt Smith, Executive Director of the World Rowing Federation (FISA) said, “the massive coverage across Europe’s multitude of broadcasters has been fantastic as this ‘aggregation effect’ was a cornerstone goal of this first combined European Championships. Our athletes have really relished the major event feel, making these European Rowing Championships really memorable for them. Avid is the official broadcast graphics platform supporter of the event in Glasgow, providing its graphics tools and workflow solutions. Avid’s Maestro | Designer forms the backbone of the Championships’ visuals, giving production teams the power to create eye-catching 3D graphics, news updates and other visual content – all while manifesting the European Championships’ visual brand. The graphics template for the European Championships has been designed by United Senses. Also working with European Championships Management on graphics and data provision are Atos, Microplus (aquatics), MTS (golf) and Swiss Timing. Marc Stanislas said, “Glasgow City Council came into a partnership with Avid for graphics rendering, working with all our different graphics providers. It was complicated here in Glasgow to integrate the graphics as each federation comes with its own graphics approach. This was quite a big challenge, to unify the graphics template approach,” he said. Louis Matignon, Multiplatform Solutions Manager at Eurovision Media Services said, ”as the host broadcaster we are at the heart of the operation, which gives us a unique position to help media organisations create and expose more stories on all platforms and maximise their reach. Earlier this year, we announced an upgrade to Eurovision Highway, our VOD platform that allows broadcast partners and rightsholders to preview, download and share broadcast quality video files related to an event or sport discipline. “Being at the source of the live content, we can inject all multilateral content transmitted over the Eurovision Global Satellite and Fibre Network directly into the Eurovision Highway platform accessible by rightsholders. “For the European Championships, all of the additional content produced by our HB crews and not transmitted on the integrated feeds is going into this platform (e.g. highlights, ISOs, noticeable slow-motion, isocams, clips from ENG crews). We have also engaged dedicated ENG crews in Glasgow and Berlin to create additional stories to feed our rightsholders’ storytelling. This content is distributed through Eurovision Highway. “On top of this, we have also introduced two platforms where broadcasters can easily find event content and branding assets to create social media and web clips. And there is, of course, the Eurovision Virtual Reality App to enable broadcasters provide a unique experience for audiences,” said Matignon. “For the purpose of European Championships we’ve extended the Digital Services Desk at our headquarters in Geneva with a mission to enrich the content. Our team of about 30 people watches each clip on Eurovision Highway adding specific metadata to the content – such as the name of the athlete, the sports category, the type of event and more – so that the journalists working under pressure can easily search and find the videos they are looking for. “Thanks to the connectivity we have between the event sites and our Eurovision Control Centre (EVC) we are able to set up the Digital Services Desk here in Geneva and avoid the complexity of setting up such an operation on-site as well as the costs of sending the team and so forth,” said Matignon. From 7-9 August in Berlin, four cameras were used to capture selected track and field events at 100 frames per second, twice the frame rate of current state-of-the-art live broadcasts. The resolution was 4K (2160p) and the HDR pictures had a wider, richer range of colours, with brighter whites and deeper darks. The events covered included three of the men’s decathlon disciplines, the men’s discus final, the quarter-final of the women’s long jump and several track events. The footage was encoded live in HEVC. 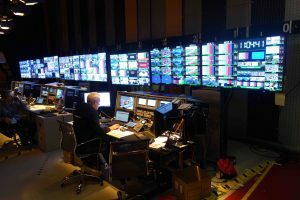 Alongside the 4K signal, two HD signals were derived, one at 100 frames per second and one at 50 frames per second, with all three carried to the test sites on the Eurovision Global Network. 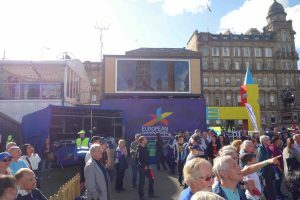 Visitors to the European Championships Broadcast Operation Centre in Glasgow could view the images live from Berlin, while further distribution tests were carried out at the Aosta Valley in Italy. EBU Members BBC, ZDF, France Télévisions, RAI and the IRT (the joint research centre of the German, Austrian and Swiss public service broadcasters), all played leading roles in the collaborative project. As a complement to the television coverage and designed to enrich the live experience, an innovative virtual reality app, European Championships Lounge, has been released and made available to EBU Members. Broadcasters are able to personalise the VR experience and offer it to their audiences as a supplementary tool, engaging new audiences and driving them on to the extensive television coverage on offer. Over 50 hours of VR content from the athletics events at the Olympic Stadium in Berlin is being made available on the app, produced by LiveLike, alongside live feeds from the other sports taking place in Glasgow. 180˚ and 360˚ cameras enable viewers to choose between multiple live feeds and enjoy the live statistics integration to keep track of the leaderboards and their nation’s rankings. The app is available in Google, Apple and Oculus stores.